Hilary Hodge is running for county supervisor in District 3 this year. Nevada County Democrats has endorsed her. Here in her own words are the answers to key questions that will illuminate the voters. What inspired you to run for county supervisor? Have you ever done this before? We found home when my partner and I moved to Nevada County nearly ten years ago. We love our community and want to spend the rest of our lives here. Last year, we bought a house in Grass Valley and moved my mother in with us. Year after year, since calling Nevada County home, we’ve watched our friends and other young people leave our community in search of better opportunities. As a young person living and working in Nevada County, I have seen my peers struggle to find affordable housing and jobs. As a volunteer for many of Nevada County’s service organizations, I have seen our fixed-income seniors struggle to make ends meet. As a start-up business adviser, I know that the entrepreneurial spirit is alive and well in Nevada County, but that many small business owners struggle in a changing economy. Skilled workers and educated people are struggling to find employment and stay in the community they love. I have never run for office before, but I chose the Board of Supervisors because of their specific influence on economic policy in Nevada County. The Nevada County Board of Supervisors sets the budget for the county. They appoint key positions to advisory committees like the Mental Health Board and the Planning Commission. The Supervisors help to develop the county’s economic development plan and create ordinances that influence policy affecting small businesses, affordable housing and quality of life. Our board’s budget and policies have a direct impact on the daily lives of Nevada County residents. Our county’s policies are failing young people and compromising the sustainability and prosperity of our community. Nevada County has a thriving retirement community and an aging population. Without a balance of young families, a skilled workforce, thriving schools, and staffed hospitals, we will not be able to support Nevada County’s future. I’m running to offer a fresh perspective for Nevada County’s Government and to ensure Nevada County’s future. What qualities about yourself will you bring to this position? As the Executive Director of Sierra Commons, Nevada County’s small business education center, I have helped to create jobs in Nevada County. I worked in social service and I know how government programs work and how to make them better. Have you ever held a public office? If so, tell me about it or them. If not, what have you been involved with that is similar to holding a public office? As the Communications Chair for the CDP Rural Caucus I have to work to help craft and inform legislation. I have sat on boards and commissions for nearly 20 years. 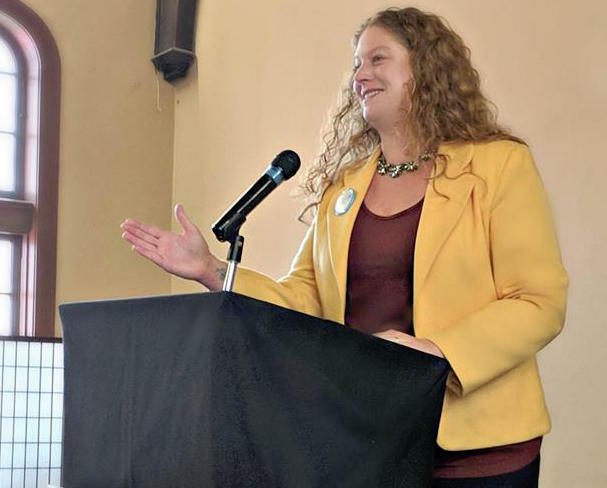 As the president of the Sacramento chapter of the National Organization for Women, I worked closely with the California legislature to move forward bills that help to improve the lives of women and girls. Name the most important issues of the day and prioritize them. Jobs – Small businesses are the backbone of our rural economy. We must support local talent and invest in local people. I’ve been a job-creator; I support smart economic development in Nevada County. Housing – In order to create a sustainable future we must have affordable housing. We need housing for young families, our workforce, and fixed-income seniors. Affordable housing is a priority for me. Technology and Innovation – High-speed internet is critical to education, healthcare and jobs in our community. I’m committed to supporting the effort to bring high speed internet and innovative economic opportunities to all of Nevada County. Safety – I’m committed to keeping Nevada County safe. We need increased measures for public safety to ensure our homes and communities are protected from wildfire and crime. How will you address those issues differently than the present supervisors? Economic development has been focused outside of the county. I would instead invest in local talent in order to ensure economic vibrancy. I would work with the Housing Authority to ensure funded projects get built. I would propose streamlining the building process for ADUs (Accessory Dwelling Units) and amortizing or eliminating permit fees for accessory dwellings built to support affordable housing. Our entire Board of Supervisors must work to get funding for infrastructure to support high-speed internet. We must take advantage of current legislation to fund in-grounding of public works to prevent fire and, at the same time, add broadband in our entire community. We must work to prevent wildfire by supporting people who need to clear brush. I would take advantage of grants available for fire prevention. We need to support hiring more staff for law enforcement and firefighters. Currently, many of our folks in uniform are working overtime where staff needs to be hired. We must enforce current laws for home clearance for wildfire prevention. Is there anything the present supervisors are doing well that you would maintain as a county supervisor? Recently, the county hired Brendan Phillips to be Nevada County’s Housing Resource Manager. He provides structure and holds regular meetings of all the key players focusing on the issues of housing and homelessness so that our community can collaborate to serve those in need. I would maintain this kind of infrastructure which provides collaboration. Anything else you would like to share with Nevada County Democrats? When I’m not working I’m spending time in my garden or singing with Music in the Mountains. I live in Grass Valley with my family.